Finding brand followers and ultimately, brand advocates, is like finding a gold mine for businesses marketing their solutions through tools like social media. Social currency is what makes a brand's social media activity worthwhile, and it begins with social proof — the idea that associating oneself with or sharing perceived "good things," like popular products/ideas, tips or innovations, will make us appear intelligent, attractive or important to others we'd like to impress. Turning that initial social proof into more meaningful action — a concept that is referred to as social currency for brands — makes the sometimes hard-to-measure activity of social media engagement into a true value with true sales potential. So, how can brands motivate people — without the direct promise of anything in return — to become advocates and promoters of a product or service? Below, we share how three brands have developed successful campaigns that do just that. There's no question that consumers, and humans in general, love to feel important and special. Being part of something perceived as exclusive, high-end or unattainable to some others makes us feel this way. Marketers understand that this feeling not only results in a consumer's greater desire and enjoyment of a product, but it can also lead them to share their good experience with others. 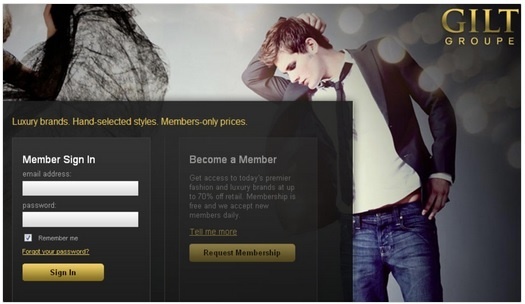 Gilt Groupe, a high-end fashion discount site, offers exclusive opportunities like flash sales, private sales and member waitlists, where members only can invite others to join. The brand gains social currency by introducing the ideas of exclusivity and scarcity that makes their fans feel they have inside information that connects them to the great, discounted products they desire. Brands that opt for developing off-color campaigns that seek the 'quick laugh' or use shock tactics sometimes take a risk when it comes to the reaction of consumers. 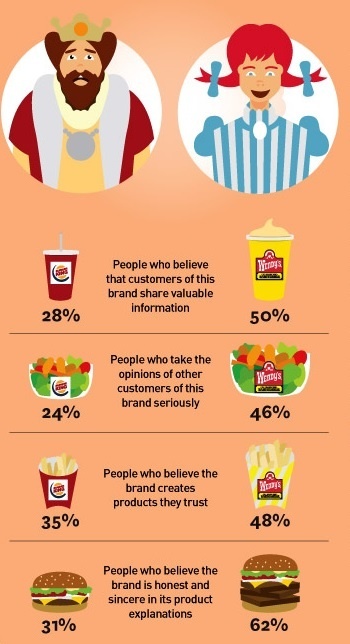 While it's hard to predict what will elicit a negative or positive reaction, one lesson learned by comparing campaigns of Burger King and Wendy's gives insight for other brands considering the image they want to project. Wendy's "You Know When It's Real" campaign highlighted its never-frozen hamburger patties with commercials, online games and contests. Conversely, Burger King made an attempt at humor with it's own campaign, called the "Whopper Sacrifice." The burger chain promised a free hamburger to anyone who 'unfriended' 10 friends on Facebook — a risk for sure with consumers, but which campaign worked? As you might expect, Wendy's approach that featured the benefits of its product while using fun and engaging activities, won the day when compared to the edgy, confrontational campaign by Burger King. Consider the results, or social currency comparison, of the two campaigns, shown in the infographic excerpt below from a Vivaldi-Lightspeed study featured by Fast Company. The results show that Wendy's gained more trust and loyalty with customers through their campaign, compared to the Burger King campaign. Dunkin' Donuts takes a fun and spontaneous approach to social media engagement. Its director of interactive and relationship marketing has two rules for online campaigns: 1) make them fun and 2) make them cheap. Some high-yield promotions involve not much more than customers submitting requested photos for an in-store discount. With the rules in mind, their campaigns are geared toward making their patrons into mini-social-media-celebrities, resulting in widespread sharing and high engagement. Another well-known brand, Starbuck's, spends its online campaign budget on projecting their product's superiority. Some ads even make customers feel they are the lucky ones to have the privilege of drinking Starbuck's coffee. 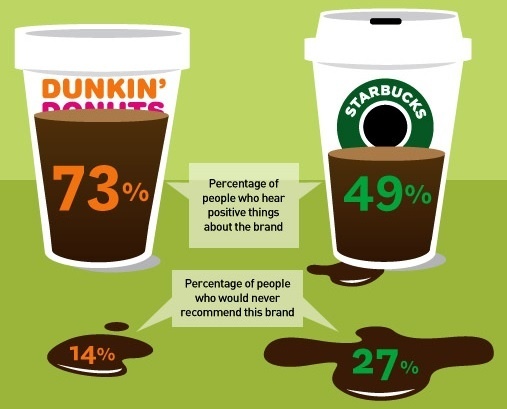 While Starbuck's approach certainly appeals to those who are attracted to superior or exclusive products (Starbuck's has 80% more Facebook and Twitter followers than Dunkin' Donuts), the infographic excerpt below shows a Vivaldi Partners study revealing that Dunkin' Donuts' approach gives them greater social currency when we look at how well the online activities delight and move customers to action. 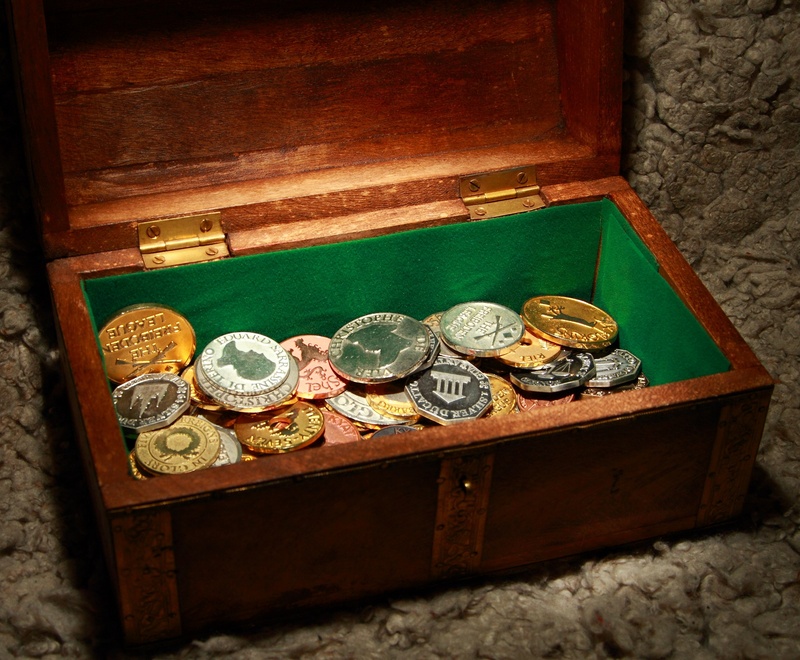 Social currency can be the gold mine that results from an investment in meaningful and regular social media activity by your brand. The three brands discussed in this post are able to project the right messages to willing advocates who are ready to share the message of what the company stands for. Not every brand should be social (read about Gillette's experience here). Results come from thoughtful actions, not always the most expensive ones. What activities has your company used to build social currency? Please share your ideas in the 'Comments' section below. As you're developing focus around your target audience on the web, check out our resource below to help you better identify and understand your brand's unique buyer personas.